Should Coaches Limit Players Touches In Training? Why do we limit touches in training? It’s something you’ll almost certainly have heard or hear at some stage if your involved in the game. Yes it’s the famous training phrase “Play one touch” “Play two touch”. A rule or condition which is most commonly used in training games to encourage players to pass the ball quicker, improve their awareness, increase the tempo of the game and various other guidance elements associated with the rule/condition. But the question we are asking is this, is limiting touches forcing decisions rather than testing or improving them? Let’s clear things up from the off on this subject, we are solely speaking about limiting touches for young footballers who are at a crucial stage of developing game intelligence and common decision making traits. So what sparked our interest in the topic of limiting touches?. Back in April of this year FC Barcelona’s famous youth academy La Masia visited the Rep of Ireland for the very first time and Keepitonthedeck was on hand to witness their stay. One of the teams competing in The Academy Cup tournament at St Kevins Boys Football Club was using the astro turf facility at St Kevins Boys one Saturday afternoon. They finished their warm up with a high tempo ‘one touch’ 7 aside practice. One of the FC Barcelona coaches is stood watching the warm up and we couldn’t help but notice him look astonished as the academy coach from the team in question stopped play and awarded a free kick because one of the players took two touches to make a yard for a strike at goal. With the help of one of the translators who was assigned to the FC Barcelona camp we brought up the reaction we had noticed asking “you seemed confused or surprised when the coach stopped the practice game just then” the answer the question got was very interesting. The Barcelona coach explained that he see’s many academy clubs use restricted touches during practices, not just for warm ups but in general training to, “why this” the coach asks “why this rule for the kid”. The coach continues to talk and the translation was fascinating. The Barcelona coach spoke of how this game is very simple, as he put it “you pass, you dribble or you shoot”. Decision making and developing quick intelligent decision making within young footballers is seen as something of upmost importance to the coach from Barca. Limiting touches was described as something which left the child with less decision’s and options, when translated he put it “if you tell the child he has one touch he can only make a pass, he cannot dribble, he can rarely shoot, he can rarely impact movement by attracting opposition players. With freedom of touches we can identify the natural decision of the child and guide his decisions, does he dribble, does he pass, does he shoot, why should he do these things, where should he do these things, when should he do these things”. It really got us thinking here at Keepitonthedeck. We would love to hear coaches thoughts on it. Why do we limit touches in game or training practices and does it really help develop awareness, quick decision making and movement or is it forcing decisions that are non realistic to the game itself and thus limiting the opportunity for coaches to guide a kids game intelligence and help improve their natural decision’s in game like scenario’s? 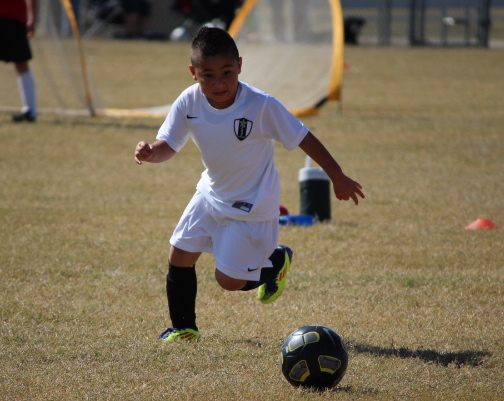 Dribbling is a major part of the game just as much as passing is, kids to need to develop awareness and understanding of when and where to use those skills, limiting touches does not test that awareness and decision making. Yes! I want to join your mailing list to receive the latest news and updates from Center Circle!